Stomach sleepers will benefit from a medium-firm to firm mattress. When sleeping on your stomach you need to make sure you have a more solid surface to prevent your back from bowing. If a mattress is too soft and you sleep on your stomach you may have lower back pain and just be less comfortable for an extended period of time. In our best mattresses for stomach sleepers we have narrowed down our top picks for mattresses that provide an ample amount support and firm comfort that will be ideal for this position. We have tried each of these beds ourselves and can confidently recommend them. Sleeping on your stomach means that you need a surface that will remain relatively flat to keep your back from bowing. The best mattress to provide a flatter surface is a firmer mattress. A mattress that is firm enough on top to cradle your body just enough to be comfortable but keep your spine aligned is ideal. You don’t want it to be too firm though, you don’t want your arms falling asleep because they aren’t able to be contoured to either. You will need a supportive, durable core and layers on top that allow the mattress to fall between a 5.5 and 9 on the soft to firm scale. Much of the feel is also dependent on personal preference, that is why we recommend a range. As long as you are supported and comfortable that’s what is important. Overall you would probably do best with looking at mattresses that fall in the medium-firm or luxury-firm categories up to the firm mattress options too. Support and firmness or feel aren’t the same thing. 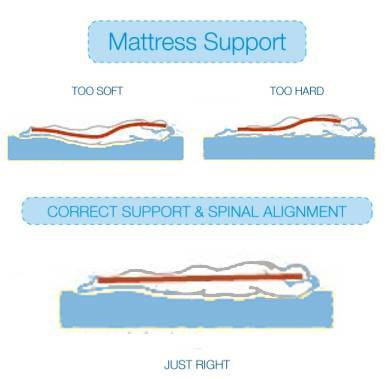 We use the word support in reference to the core of the mattress that provides the necessary foundation that gives you proper spinal alignment. The feel pertains to the comfort levels of the top layers that range from soft to firm. It’s good to understand that a mattress can have poor support and still be firm just as a easily as a bed can have great support and still be soft. This is where the core or foundation of the mattress play an important role. When looking for a mattress for a stomach sleeper you want to make sure that you aren’t sagging or your back is bowing. You want to feel very slightly cocooned by the top but not too much where it affects your posture. You also don’t want it to be too firm or too supportive, this can cause issues with your arms falling asleep or being uncomfortable too. Also, it’s very important to have the proper pillow for stomach sleeping too. A pillow that is lower loft, or thinner, will allow your neck to stay aligned with your back and be the most comfortable. Are you a stomach sleeper who wants a memory foam mattress? Look no further than the Puffy. This bed uses 4″ of dense, cooling memory foam over a durable base creating an ideal medium firm feel. This feel is perfect for the predominant stomach sleeper and even works well in other sleeping positions. 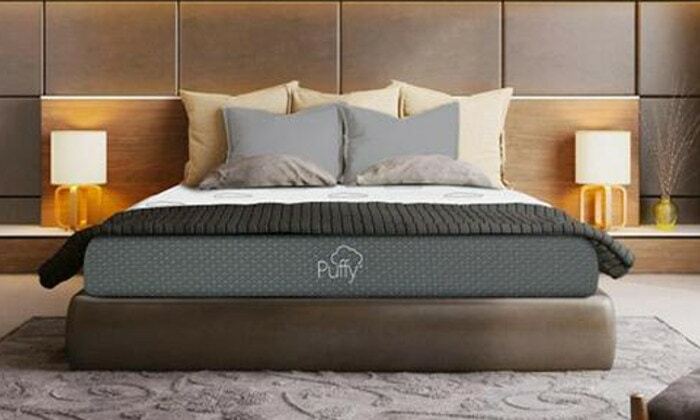 The Puffy mattress is a 10″ thick, two layer bed. This mattress incorporates patented foams for a “cloud like” sleeping experience. Its unique and modern memory foam top layer is adaptable and curves to every point of your body. This makes for ideal spinal alignment as well as pressure relieving comfort. It is not hard to see why this mattress has become a fast favorite in no time at all. Make sure to save a $250 with our EXCLUSIVE coupon code: OSG250. Want a mattress that has great support and ideal pressure relief that adapts and contours to your body. You like a medium firm mattress that comes in at a good price point as well as offers a lifetime warranty. The idea of sleeping on a cloud sounds appealing! The Tomorrow Sleep mattress is another brand with a reputable name behind them. This newer hybrid bed is partnered with Serta Simmons to bring their latest technology to the bed in a box table. This hybrid is also available in two comfort options, medium soft and medium firm. With the firmer option definitely being preferred for stomach sleepers. Tomorrow Sleep is not only focused on their mattress but more or less really taking a holistic approach to sleeping. Their determined that good sleep starts with the proper mattress but can be optimized with a full encompassing sleep solution. Along with their mattress they also have come out with an entire line of products to promote the best and most restorative sleep. Potentially the most important of these accessories is their innovative sleep tracker. This small device easily connects to your mattress to analyze your sleeping patterns to offer suggestions for better rest. If Tomorrow is the bed for you make sure you also use coupon code: OSG100 to save $100. The Bear all foam mattress is another universal medium-firm mattress. This one like many others borders on the firmer side and makes if great for stomach sleeping. Another great feature of this mattress is not only its true memory foam feel but price point too. After our coupon this bed is under $800 and is worth every penny of its affordable luxury feel. The multiple layers of foams in this bed create a dense and sturdy feel that allows you to sink in just enough. This mattress is even covered in a Celliant infused fabric to help your body repair and restore while it sleeps. This unique technology is ideal for athletes or anyone who needs some extra rejuvenation. 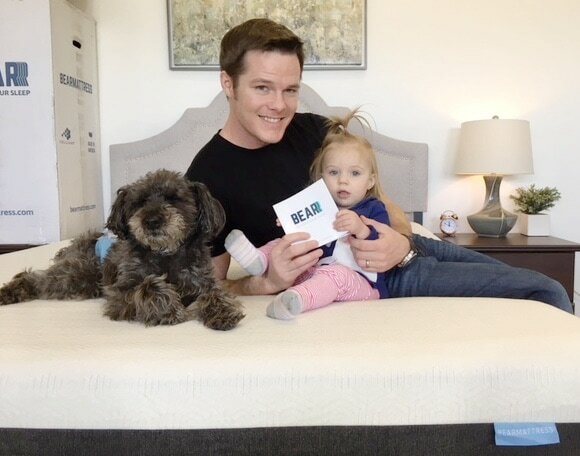 Read our full review HERE or BUY your Bear mattress NOW at bearmattress.com. You like a medium mattress with good support and the comfort of memory foam. 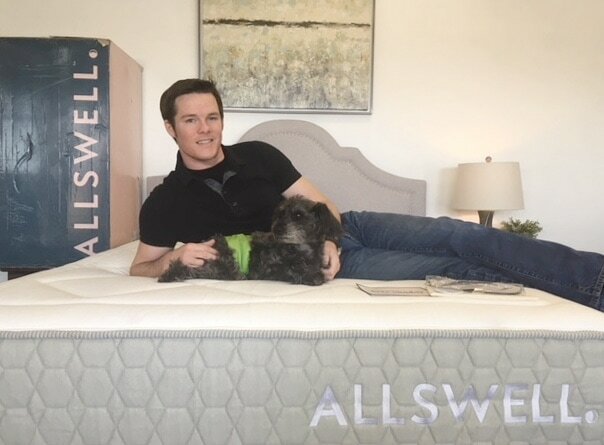 Allswell is a line that offers both a memory foam and hybrid mattress. The hybrid mattress uses dense and durable coils under solid yet pliable foams. This combination creates a great medium-firm feel ideal for stomach sleepers. The solid edges and fully usable sleep space make this a great option for a hybrid bed. The support is plentiful and the feel is just soft enough with out allowing your back to bow. This brand not only offers some great mattresses but the pairing of luxury curated bedding really make Allswell unique. The custom selected bedding options pair perfectly with your ideal mattress for a completed look. You get a quality bed at an affordable price and all the designer picked details to take your room from drab to fab. Read our full review HERE or BUY your Allswell Hybrid mattress NOW at allswellhome.com. The Cocoon by Sealy is another great option for stomach sleepers who want a memory foam mattress. This bed has a solid reputation and uses quality materials. For stomach sleeping the firmer style would be preferred, but even the softer choice will still have plenty of support. Sealy’s bed in a box uses 3 layers of foam to create a 10″ mattress. You can even choose between a soft or firm feel. This mattress has a thick top layer of memory foam to give you a hugging and cocooning feel, hence the name. 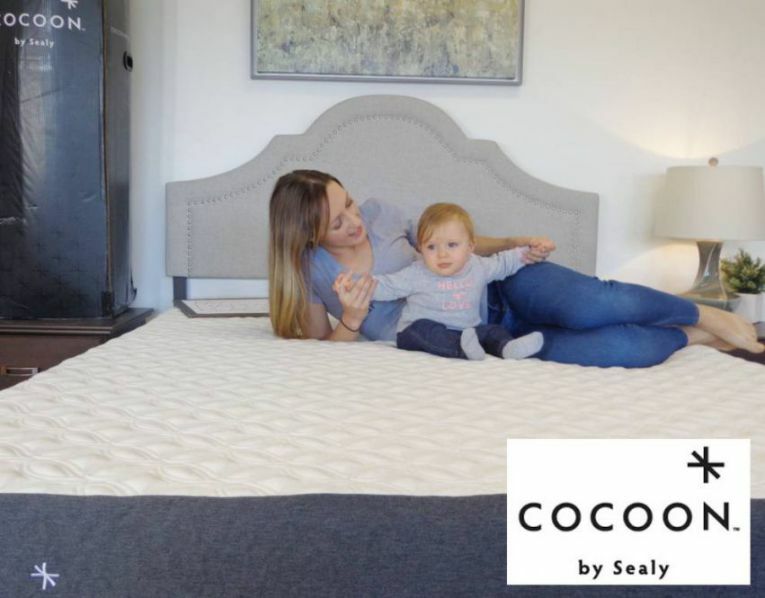 The Cocoon mattress has an instant edge over its competition with the well known Sealy name behind it. Using years of experience and innovation to create this premium mattress. Their are two options when it comes to this mattress. The Chill has added cooling properties in its cover to give it an instant cool to the touch feel. While the Classic is a great price point without the extra cooling cover. Also, save $100 on your Cocoon purchase with code: OSG100. You like an established brand with a good quality mattress at a good price. You like a true memory foam mattress that is either a touch soft or a touch firm. If you want a memory foam mattress that doesn’t get too hot and has added properties to keep you cooler. The Saatva is one of the top picks for stomach sleepers for clear reasons. This very durable and solid mattress doesn’t have just one coil system, but two. Giving it amazing support that is flexible and contouring but ideal for proper alignment in every sleeping position. The top notch materials and construction make it usable from every inch and maintains a consistent feel. The Saatva is available in either 11.5″ or 14.5″ and uses the same materials with the only difference being the base coils are shorter in one than the other. The dual coil system is combined with premium layers of foam for a balanced feel without being too soft. This is ideal for stomach sleepers and any sleeper who likes solid support. There is also a layer of memory foam to create just enough pressure relief without feeling stuck or sinking in. This is yet another reason this is our top pick in the best mattresses for stomach sleepers. 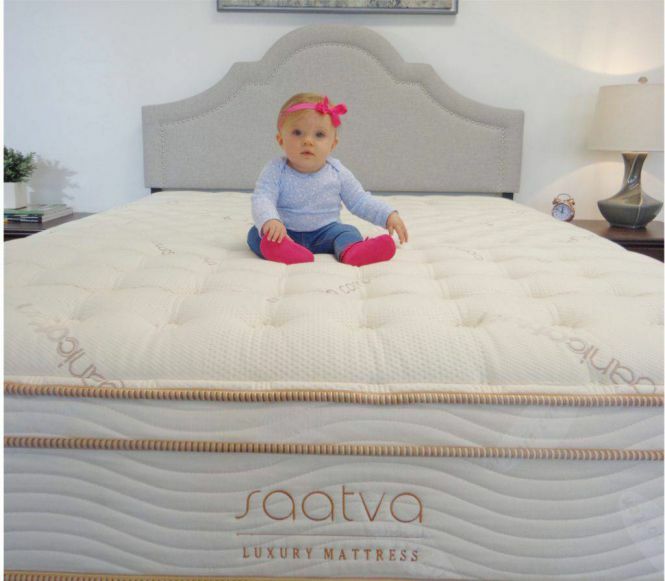 Read our full review HERE or Shop the Saatva mattress at Saatva.com. If you like a traditional feeling mattress that comes in two comfort options that will both work great for stomach sleepers. This mattress is hands down our favorite memory foam mattress to date. 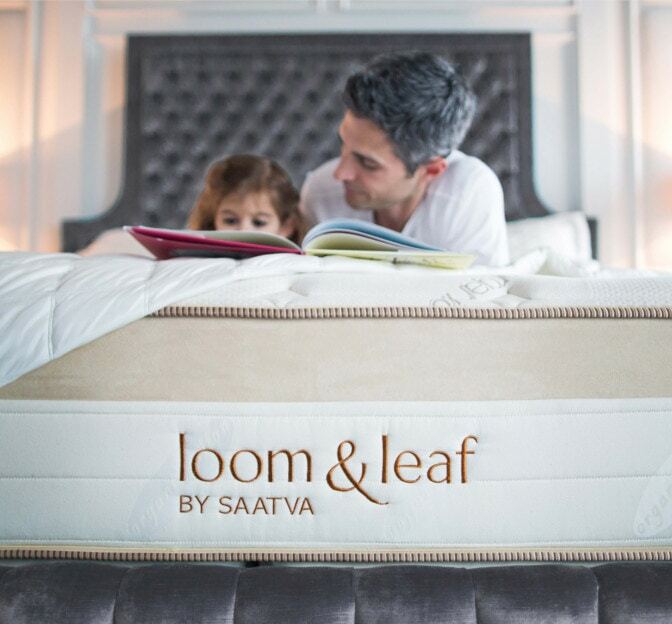 The Loom and Leaf mattress is made by the same company that is in our #1 spot, Saatva. This one is the all foam equivalent and is an ultra-luxurious memory foam mattress that shrinks the competition. Literally! This 12″ thick premium all foam mattress uses high quality, dense foam layers. Along with top notch construction that creates a perfectly contouring and responsive mattress. The Loom & Leaf bed is a fraction of the price of mattresses that you would find in stores with the same qualities. It has outstanding features & benefits that check all the boxes. This mattress is ideal for stomach sleepers and offers more than plenty support. Hence why it is our second pick for the best mattresses for stomach sleepers. Like a memory foam mattress that allows you to choose your preferred level of firmness, but has plenty of support for stomach sleeping either choice. If you want a bed that delivers on premium comfort and ideal support. Has minimal motion transfer, sleeps cool and comes in at a great price point. You like a company that creates a great product and stands behind it with a solid warranty and trial period. As well as provides the best customer service.